Description: Top-floor & topnotch! 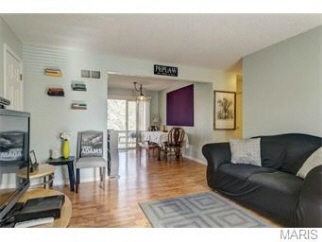 Close to i-70 in desirable st. Peters, this upper-level 2-bedroom condominium is crisp, bright & incredibly affordable. Like new! – fresh paint throughout, fully remodeled bath, plus wood laminate flooring, dishwasher, disposal & water heater all recently installed. Some window treatments also included. A peninsula work counter separates the fully-equipped kitchen (with pantry & generous cabinetry) from the dining area, which opens to the spacious family room. Overhead lighting in both bedrooms; ceiling fan & his-&-her closets in the master bedroom. Trees surround the private deck – & for added value, provided exterior maintenance, community pool, assigned off-street parking & top-ranked fort zumwalt schools!